Practice HTML questions and answers for interviews, campus placements, online tests, aptitude tests, quizzes and competitive exams. This set of HTML Multiple Choice Questions & Answers (MCQs) focuses on “Audio and its MIME Types”. 1. Which of the following MP3 player has not been written in Flash? Explanation: There are several MP3 players that have been written in Flash like flash-mp3-player.net, www.wimpyplayer.com, musicplayer.sourceforge.net. Every player has different functionality. So you should be aware of that. Soundcloud.com and MySpace.com are different sites which provide a player that one can embed in the page. 2. Which of the following is not the attribute for <audio> element? Explanation: <audio> element has various attributes like src, controls, autoplay, preload, loop, buffered, crossorigin, muted. Width is attribute basically use for <video> not for <audio> element. All the attributes and <audio> element is newly introduce by HTML5 to make page responsive and user friendly. 3. What is the work of controls? 4. Which element is used for inserting more than one audio file? Explanation: <src> provides or states location i.e Url of audio file. For inserting more than one audio file, use <source> instead of src attribute between <audio> and </audio>. This can be important because many browser support different formats for audio. For example MP3 is supported by Chrome6+, Safari 5+. 5. What is the work of src? Explanation: src attribute basically specifies a path to the audio file. It is also used by <source> element which indicates where the audio file is located. Autoplay attribute starts playing audio automatically, loop plays audio again after it finishes. 6. Which of the following file extension is not used for audio MIME? Explanation: For accessing audios in different browsers we can use various extensions like .aac, .mp1, .mp1, .m4a, .mp2, .mpg, .mp3, .mpeg, .oga, .ogg, .wav, .webm. For video we have file extensions like .mp4, .ogv, .m4v, .webm. It is noticeable that some extensions are common both in audio and video. So user should pay attention where to put these as per the need. 7. Which format is a restricted version of Matroska? Explanation: WebM format rely on the restricted version of Matroska format. WebM format is both for video and audio in HTML5. The MIME types as WebM files are audio/webM. This is the example where WebM media file is there only containing audio. 8. Which format is not supported in Internet Explorer? Explanation: Ogg format is supported in mobile, desktop, chrome, safari, opera. WebM is preferable over Ogg Theora Vorbis due to the better ratio of compression and quality and most of the browsers support WebM. Ogg format can be used to support old browsers. The MIME type of Ogg file that has audio is audio/ogg. 9. Which browser does not support MP4 H.264 format? Explanation: The MP4 H.264 format is supported by Safari, Chrome, Internet Explorer. Opera and Chromium do not support this format. This MP4 H.264 is used for both video and audio. This format is not freely licensed so commonly not that much used on an open web platform. Explanation: MP3 audio format is supported by Firefox, Firefox for android as well as for iOs, Internet Explorer, Safari, and Chrome. The MIME type for audio is audio/mpeg, .mp3. Usually used with <audio> element. Opera does not support the MP3 format. Explanation: WAVE format is usually supported by Firefox, Internet Explorer and Safari. The files end with the extension “.wav”. MIME type for audio is audio/wave or audio/x-wav or audio/wav or audio/ x-pn-wav. Explanation: Flac audio format is supported by mobile Gecko 58.0 (Thunderbird 58.0/ Firefox 58.0/ SeaMonkey 2.55) and desktop Gecko Firefox 51.0 (Thunderbird 51.0/ Firefox 51.0/ SeaMonkey 2.48). Extension for the FLAC format is “.flac”. MIME type is audio/ flac or audio/ x-flac. 13. Which of the following is not a Boolean attribute for <audio> element? Explanation: Autoplay is a Boolean attribute and its default value is set as false. Basically, this feature of autoplay is avoided due to the unpleasant experience of users. Loop is also a Boolean attribute. Muted is Boolean attribute whose value is set as false by default. Buffered is not boolean attribute in <audio> element. 14. What can not be done by controls attribute? Explanation: Controls attribute of <audio> element provides a user the facility of playback with volume, seeking, pause, resume playback. Looping can be done with loop attribute which is a Boolean attribute. It automatically seeks back to start when audio reaches to end. 15. Which browser supports mozCurrentSampleOffset? Explanation: mozCurrentSampleOffset attribute is not supported by Chrome, Edge, Internet Explorer, Opera or Safari. It is only supported by Firefox. This is an offset which specifies the number of samples from the beginning of audio to the place where audio is currently playing. 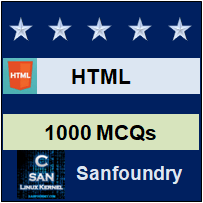 Sanfoundry Global Education & Learning Series – HTML. To practice all areas of HTML, here is complete set of 1000+ Multiple Choice Questions and Answers.